Have you been wondering why many rave about Faber Castell Polychromos? It’s one of the more expensive brands of colored pencils but is it worth the investment? Are there cheaper alternatives that are just as good? If you’re a fan of oil-based colored pencils, you’ll find Cindy Nation’s review informative and interesting. 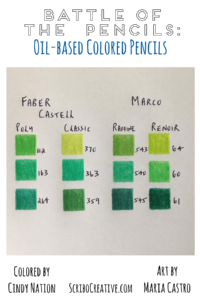 Cindy owns four brands of oil-based colored pencils and has generously reviewed all four for us — Faber Castell Polychromos, Faber Castell Classic, Marco Renoir and Marco Raffine. Cindy lives in Australia as you’ll notice on her price quotes but we’ve added Amazon.com links within the article for your convenience. She chose one of the motivational full-size pages from HEALTHY HUE — A Coloring Health & Fitness Journal with Positive Affirmations, to color in and show the differences. Let us know if you’ve had similar experiences by leaving a comment at the end of the article below. Enjoy the review! This beautiful image is from Maria’s new coloring journal HEALTHY HUE. I have coloured this using four brands of oil-based pencils: Faber Castell Polychromos, Faber Castell Classic, Marco Renoir and Marco Raffine. The wording at the top “I can reach my goal” double section is coloured using Polychromos. Then each double section following that in a clockwise direction are: Classic, Renoir and Raffine. The “goal” is coloured using Polychromos. I tried my best to colour match across the four brands of pencils. Here is my comparison and personal opinion of these four brands of pencils: The core in oil-based pencils is harder making them less likely to break and helps keep a sharper point for longer. I use a good quality sharpener and haven’t had issues with breakage of leads. They all have rich pigment, although the Marco Raffines aren’t quite as good as the other three. I prefer the Polychromos colored pencils but you will pay more for them. They blend and shade beautifully without much effort. Available in sets of 12, 24, 36, 60 and 120 or as individuals in some art shops and Ebay. As I’m from Australia, I bought my set at my local Riot store when they had a sale. A set of 12 is available for $27.50 AUD ($19.35 US) or a set of 120 $273.50 AUD ($193.50 US) + shipping. However, the Faber Castell Classic colored pencils are a budget pencil which still shade and blend nicely but you do have to work a bit harder to get a good result. Available in sets of 12, 24, 36 and 48. A set of 12 is available for only $3.50 AUD at my local Kmart store. These pencils are available in most department stores at a very good price but not individually as far as I can tell. Marco Renoir colored pencils are artist grade and better quality than their less expensive counterpart Marco Raffine. They blend and layer well, are much creamier and give a vibrant colour. I bought mine from Ebay but recently bought a larger set from Wish. Available in sets of 24, 36, 48, 72, 100. A set of 24 is approximately $21 US or set 100 $60 available from Ebay (be careful of are extra shipping charges). As far as I can tell these are not available as individuals. Marco Raffine colored pencils are a student grade pencil. I found that you can still blend and shade but they are not as smooth as the other three brands. I bought mine from Ebay. Available in sets of 24, 36, 48, 72. 24 pencils are $6.99 US on Ebay (shipping charges extra). No individual pencils are available. If you are starting out with pencils, I would recommend an oil-based pencil for ease of sharpening and excellent pigment. Overall, I am happy with all the brands I’ve mentioned. My budget recommendation would be Faber Castell Classic colored pencils and top-priced Polychromos if you can afford them. Renoir is good if you can’t afford Polychromos. I started with medium set and was very impressed! Renoir is equal to Polychromos in pigment. This refers to how varied the color choices are for any given set provided. Note that this a tricky category to compare. For example, Marco Raffine’s smallest set has 24 colored pencils whereas Faber Castell Classic come in 12. Polychromos colored pencils have no pink in the small set and they are ranked last. Classic colored pencils are ranked first because they have pink and gold in their small set. A great small set with great variety of colours. 120 Polychromos colored pencils are ranked first. It’s the biggest set with great variety of colours. Faber Castell Classic colored pencils are not available in a big set and therefore aren’t ranked as highly. I always recommend buying the biggest set of what you can afford. Faber Castell Classic colored pencils are a great low cost, all-rounder that blend and shade well and have good pigment. Marco Renoir colored pencils are a good price for a great product that have good pigment that blend and shade well. I always do a price comparison before I buy online and in-store. I like to get the best price particularly if I’m paying more for a better-quality product. I recommend buying the biggest set you can afford as you get more colour variety within the set. We hope Cindy’s oil-based colored pencil review helped you decide on the best brand to get. However, as with many coloring activities, the choice of coloring medium is a personal choice and a matter of preference. If you’re not as adventurous as Cindy, try a smaller set of the brand before investing in a bigger set. Or, like Cindy, maybe you can have a bit of everything :). Do you like this article? Connect with us and be among the first to know about exclusive deals and coloring tips. 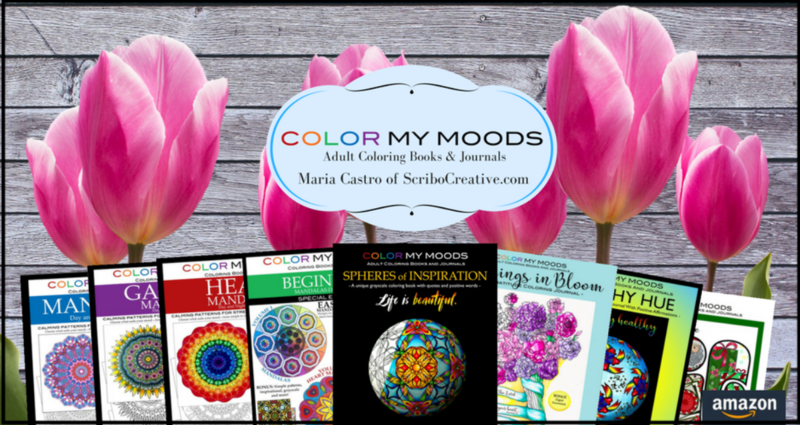 Sign up for our enews and even get an instant sample pack printables of Color My Moods Day and Night (Volumes 1-3). A wonderfully coloured Mandala with such a positive affirmation. An extremely in-depth comparison of the four brands of pencils. Well written & very useful for helping us colourists make the decision as to which set of pencils we would be better off purchasing. Thanks Dorothy! Cindy did a great job. I’m glad you find the article helpful. Happy coloring! Thank you so much. The design was a joy to colour and I hope to help some get a good idea about the quality of different brands of pencils. You’re welcome Karma. Looks like Cindy’s spot on with her opinion on Renoirs. Oh and we have a Prisma vs. Poly comparison in the works 😊. Thank you so much Karma! It’s nice to know that someone is taking the time to read it! Unfortunately, I can’t comment on Prisma pencils as I don’t own any (at this stage anyway lol). Yes I love my Marco Renoirs too! Hope you continue to enjoy them. Great comparison by Cindy! Agree that for overall ranking the Renoirs do come out on top. For ease of use, they are my top choice. If my hand is a bit stiff, the Renoirs are what I pick to work with. Another plus for the FC Classics is their hardness and ability to be sharpened and hold a point for using in tight spaces, yet they do deliver the pigment. These are my 4 favorite pencil brands that I use all the time, I couldn’t part with any of them! Thanks Cindy! Glad you find it helpful Donna and thanks for sharing your own experience with these pencils. Dknna, I appreciate your opinion also. I know you are a superb colorist, as Cindy is. I have seen your work, and now know what you prefer and why. Thank you so much Donna! It’s nice to know you read and liked the comparison. I was happy to have found Marco Renoir pencils and would happily buy them again. This has been a super helpful review for me. Thank you Maria and Cindy. Have been thinking of next small set of pencils to invest in and try. Have FC Polys ( 12) and Raffines ( 36). So now will be watching prices of FC Classics and Renoirs. Have heard nothing about FC Classics, it’s always the Polys everyone brags about and I am not really impressed with them. So will be wstching for a good buy. Happy to hear you found it helpful Connie. Sounds like you’ll be building your collection 😊. I’m so glad to hear that Connie! Hope they have a good price for you soon on the Marco Renoir or Faber Castell Classics! This is a wonderfully written, very helpful review of oil based pencils! I’ve currently got a set of both the Faber Castell Classics and Marco Raffines, which I think are just lovely – and my brand new set of Polyochromos are currently in the mail, headed this way! 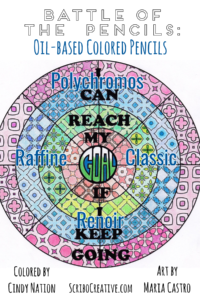 I saw that you mentioned that you have a Prismacolor vs. Polychromo article in the making – I can’t wait to see that one! I’m glad you find the article helpful Brittany. Enjoy your new pencils and yes, we’ll have the Prisma vs. Poly article soon :). I have not had the pleasure of trying any of these pencils so it is hard for me to make a judgement on my likes and dislikes. If I had to choose though I really like the vibrant colors of the Renoir Pencils.